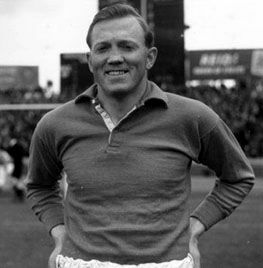 Centre-forward Albert Stubbins was one of Liverpool's most popular players in the period immediately following the end of the Second World War. Already vastly experienced and a prolific marksman when signed from Newcastle, where he scored 232 goals in 190 games in wartime, in September 1946 at the age of 27, he scored on his debut at Bolton and only missed two more League fixtures for the rest of the season, which ended with him winning a League championship medal and being equal top-scorer at the club with Jack Balmer with 24 goals each. Albert also scored four times, including a memorable hat-trick against Birmingham, during Liverpool's run to the FA cup semi-final that season. He again scored 24 league goals in 1947-48, which included four, two in each half, when Huddersfield Town visited Anfield on March 6, 1948. Stubbins became embroiled in a contractual dispute with his employers in the 1948-49 season over his desire to return to his native North-East, or at least train there. But the club insisted that he continued to live on Merseyside. Partly because of this dispute and partly because of injury-problems, Albert only played 18 games that season. Ever the professional, he didn't let his personal feelings affect his commitment to the club that was paying his wages and he again reached double-figures in the league in the 1949-50 season despite missing 14 First Division matches and was also a member of the team defeated by Arsenal in the 1950 FA cup final. By now in his early-30's, Albert's name was less frequently on Liverpool's team-sheet and the last of the 178 first-team appearances he made for the club came at Stoke on 3rd January 1953. He had kept up his record of scoring a goal almost every other game and finished his playing days on Merseyside with an impressive total of 83 in the league and cup.